Trader Joe’s calls it a pie. You know – one of those coiled cheese tube pies. In theory, this sounds delicious. How could it not be? Paper thin sheets of oven crisped filo dough filled with a thick and gooey blend of five delicious cheeses – surely that’s a prescription for gustatorial heaven, right. 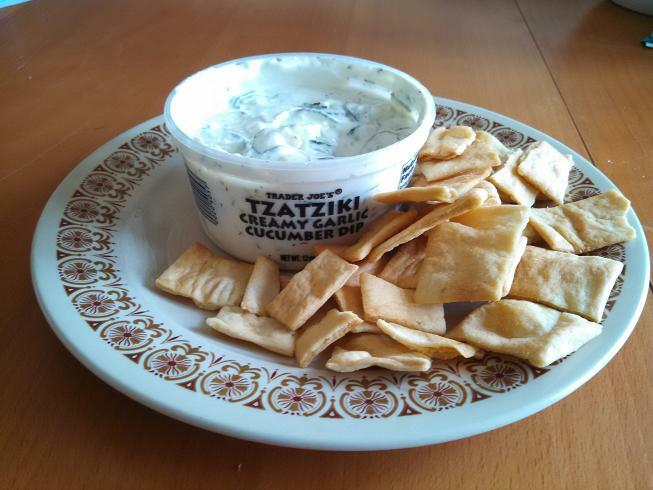 And while it’s close, Trader Joe’s 5 Cheese Greek Spiral isn’t really all that good – as if it’s missing some essential ingredient that would have tied it all together. What it is: Melted cheese in a pastry shell spiral. Worth it: No. Too bland to justify that much cheese and dough. 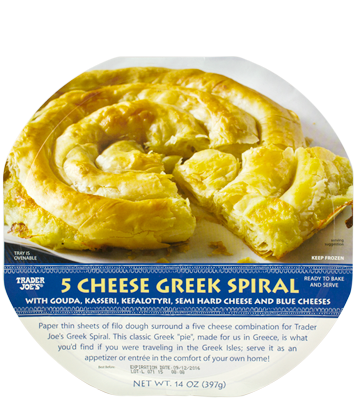 Looking like an over-sized lollipop, Trader Joe’s 5 Cheese Greek Spiral is at the very least an intriguing looking appetizer. It’s essentially a single long tube of filo (AKA pie crust) dough, filled with tons of cheese and wrapped into a single snail-shell spiral. Like a cheese-and-pastry kielbasa, or a cheese-filled pizza crust gone wild. TJ’s isn’t kidding around about that “five cheese” part either – this big honkin’ disc contains nearly a pound of gouda, kasseri, kefalotyri, “semi-hard” and blue cheese. The whole thing is placed in the oven (the oven explicitly – the packaging bans microwave use) and roasted for 25 minutes until golden, crispy, and filled with hot, bubbling cheese. So why isn’t this better than it is? It’s really hard to go wrong with cheese and dough – and yet this Greek cheese spiral failed to illicit more than lukewarm reactions from everyone I called around to try it. The problem is that there’s just nothing interesting going on with this appetizer. Lots of cheese is good in theory, but the cheeses in this mixture end up as a single, salty, mild-tasting blend, without the intriguing charm or tang of the individual components. The filo dough is also unadorned, tasting of nothing much but a bland paperiness that makes for a very nice texture, but not much else. There are no end of delicious foods that make use of cheese and dough, so it seems like a shame to waste it all on an appetizer that is merely acceptable. Pizza, for example, or any of Trader Joe’s delicious flat breads. In fact, if there’s any potential to be unlocked in this 5 Cheese Greek Spiral, it’s in treating it as a pizza-like launch pad for more interesting toppings. With the application of a little imagination it’s easy to compensate for that missing X factor. Throw a tub of artichoke dip on top of these warm cheese coils and you’d really be talking about a delicious appetizer, or simply serve alongside a ramekin of marinara or other dipping sauces. Drizzle with honey!?!? That might just be crazy enough to work. Do anything, really, just as long as you’re not eating it plain. Would I Recommend It: Not strongly. It’s pretty underwhelming. Would I Buy It Again: Maybe – I might try fancying one up for my next soiree. Final Synopsis: Lots of salty cheese in a bland crust. Should have been better. 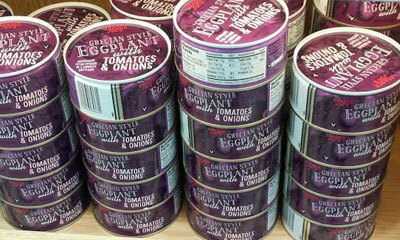 All the tinned eggplant a man could want! I’ll admit it, I find something strangely alluring about tins of food. I can’t really enunciate exactly what it is that draws me to large, sealed metal tins, but whatever it is Trader Joe’s Grecian style Eggplant with Tomatoes and Onions has got it. There’s just something of a mystique to them something, that aura of the unknown that surrounds the Mystery Box, and would lead me to trade it all for what lies behind Door Number Two. Surely that’s an impulse that we all share – even if it might be a touch harder to understand how that translates over to tins of food in my mind. After all, tin are clearly labeled aren’t they and – what’s more – generally cheap, low-quality, packed with preservatives and otherwise the last resort of cut-rate food producers everywhere. Isn’t the tin, after all, the receptacle of choice for the $0.49 can of tuna fish, the repugnant anchovy, and Armour Brand Potted Meat Food Product? Yes, indeed – but whether its a sensory addiction to the feeling of gripping the ring tab and slowly prying back the lid or something even stupider, I can’t resist the siren song of a mysterious tin of food. The last time I was lured down this path was for Trade Joe’s Dolmas, which I found off-puttingly oily but which many readers rose to the defense of as laudably authentic. 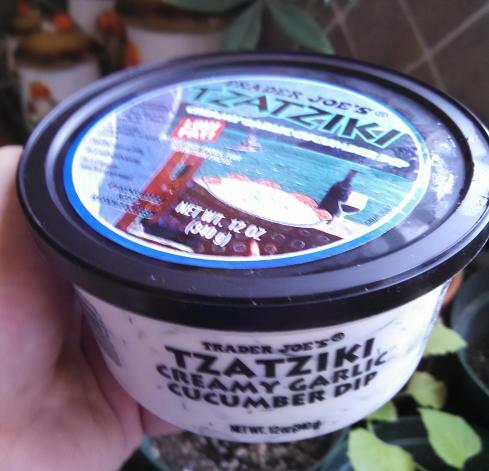 Trader Joe’s has here returned again to the Grecian well with this stewed eggplant product, even going so far as to use the exact same type of tin – namely the upside down one with the tab on the bottom. This still twirks my mind unpleasantly. Wouldn’t it be just as easy, maybe even easier, to put the label on in such a way that you could read it and open the canister at the same time? Well,whatever the reason for it, once you’ve pried open the top/bottom of the tin you’ll find a densely packed stew of the eponymous eggplant, tomatoes and onion – more of a gloop actually. All the constituent parts seem as though they were cooked gently enough to preserve much of their shape and texture, but then crammed into the tin under sufficient force to blur the boundaries between one vegetable and another. Disappointingly, to me anyways, what you get is exactly what is advertised – a mixture of the three vegetables (plus parsley, garlic and red pepper) that tastes like… well, those three vegetables. There’s no ineffable alchemy that takes place here, no whole greater than the sum of its parts – the three veggies mingle but don’t enhance each other in any remarkable way. The overall result is exactly what you’d get if you decided to stew up the same three ingredients in a pot yourself. Sure, Trader Joe’s is conveniently saving you the trouble with this tin, but the question is why? 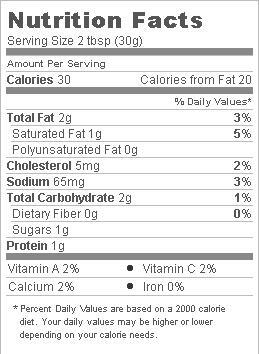 Who feels particularly compelled to get these particular ingredients in this form? That seems like a rare enough demand to me that I don’t necessarily need it on my shelf, ready to go at any moment. If I did feel the urge to have some stewed eggplant, I’d probably just cook some up myself instead of going for an oil-packed can like we have here. For a dish that’s all veggies, you wouldn’t think it would be able to pack in 250 calories of fat (70% of all the calories in the dish!). Trader Joe’s boasts that you’ll be “enchanted by the soft, melt-in-your-mouth texture and the smooth, almost squash-like, eggplant flavor.” If oily, stewed mush is something you have to have from a can, then this tin will suit you just fine. For me, I’ll be heading on to the next mystery tin without a backward glance. Would I recommend It: Not in very strong terms, no. Would I Buy It Again: I don’t see any reason to. Final Synopsis: Stewed eggplant packed in oil. About as good as it sounds.